When is TGS 2018 and what can we expect to see? Tokyo Game Show is still one of the biggest dates on the gaming calendar, a veritable spectacular of entertainment goodness taking place in the homeland of gaming. The show starts tomorrow, so consider this your cheat sheet for what you can expect to see and when. When is Tokyo Game Show? Where can I watch the Tokyo Game Show livestreams? Here's a list of the most anticipated streams and when they go live. Of course, these are aimed at a Japanese audience, so you might want a translator on hand. What will PlayStation show at TGS? We can expect to see more of Days Gone, Death Stranding, and Sekiro: Shadows Die Twice. PlayStation has already announced it will be showing off those blockbusters, along with a bounty of other titles including Kingdom Hearts 3, Media Molecule's Dreams, God Eater 3 and more. You can check out the full lineup here with a little help from Google Translate. What will Capcom show at TGS? The newly announced Capcom Beat ‘Em Up Bundle, Devil May Cry 5, Mega Man 11, the Resident Evil 2 remake, and the Street Fighter 30th Anniversary Collection should all be on display. There's even an Ace Attorney stage show. You can check out the full line up here with a little help from Google Translate. What will Sega show at TGS? Sega has partnered up with Atlus and will bring Yakuza Online, Project Judge, Phantasy Star Online 2, Shenmue 1 and 2, Team Sonic Racing, Valkyria Chronicles 4 and a new VR game. You can check out the full line up here with a little help from Google Translate. 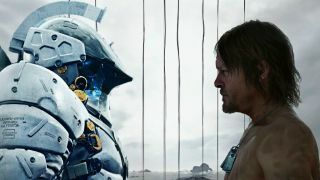 What will Konami show at TGS? Konami will bring Pro Evolution Soccer 2019, Super Bomberman R, Hyper Sports R and partner titles like La-Mulana 2 and Fighting EX Layer. You can check out the full line up here with a little help from Google Translate. What will Square Enix show at TGS? Surprising no one, not even your Aunty Barb, Square Enix's show will be an explosion of Final Fantasy. Final Fantasy: Crystal Chronicles Remastered, Final Fantasy 14, Chocobo’s Mystery Dungeon: Every Buddy! and more will go up alongside The Quiet Man, The Last Remnant Remastered and Left Alive. You can check out the full line up here with a little help from Google Translate. Tokyo Game Show 2018 takes place at the Makuhari Messe convention center in Chiba city, Japan. Of course we'll be bringing all the news, trailers and insider gossip from the show floor, so skip the long haul flight and follow us on Twitter to stay informed.